obsessed with knitting: how cute is this? If not the very cutest, Kate Gilbert's Anouk is at least the most eye-catching children's design on the Internet or elsewhere. The pattern has been out there for over four years, and has yet to be surpassed. 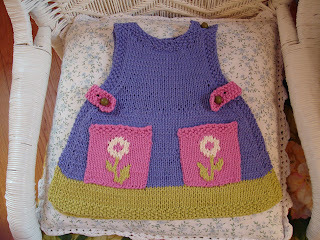 Here is the original pattern as seen in Knitty. Here is the Anouk ravelry page. As usual, I have opinions about how this pattern should be made. I think it looks best in bright cheerful colors as in the original, and the lower border must be green. 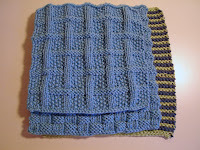 That said however, there is really no version on Ravelry that doesn't look good, even those in browns and greys. The shape as well as the surface is a winning design. Thank you Kate for sacrificing this and Clapotis to Knitty and making less than you could have made by selling them as individual patterns. I used Cascade Pima Silk (my latest favorite yarn) on number 7 needles at a gauge of 5 stitches per inch. I knit the 6 month size in width and the 3 month size in length hoping to get the 3 month size over all since the pattern gauge is 4.5. The pockets and tabs are in Berroco Comfort, a synthetic I am interested in learning more about, although the small amount used here won't give me much of an idea. It did knit up well though. Aside from baby things I haven't been doing much else. I am starting the heel of my neglected short-row heel socks maybe today, and I knit three squares of the Learn to Knit Afghan. What's wrong with this picture? Why is the top square so much smaller than the others? I understand that this is meant to teach the idea that different combinations of stitches take up different amounts of space, but this lesson should be covered by casting on different amounts of stitches. I am saving the blocking to the end, but I can't imagine that the top square will block to size without major distortion. The second square is also smaller, but I think that one can block out. 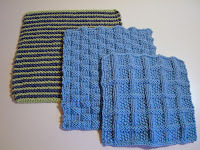 I anticipate having to do the third square over, maybe twice on different needle sizes to get in the right size ballpark. Have others had this problem? Am I doomed almost before I begin? The deer ate three massive hostas, most of the buds from my lillies, hydrangea buds and leaves, roses, and phlox. It probably has a stomach ache. I will be away from a computer all of next week. See you when I get back. I have heard that is you spread human hair around your garden it will help keep the deer out. Anouk is adorable. Every baby should have one. And I love the colors you picked. Omigod! Omigod! I am passing out from the adorableness!!!!! Other posters said it best: adorable! You are on a great baby wardrobe roll here. As for the afghan square sizes, I feel your pain. The book is lackadaisical on the subject of blocking. I aimed for 9"x9" for my squares and had to play around with placement and seaming to even things out.